Highster Mobile is very powerful and useful cell phone monitoring app. 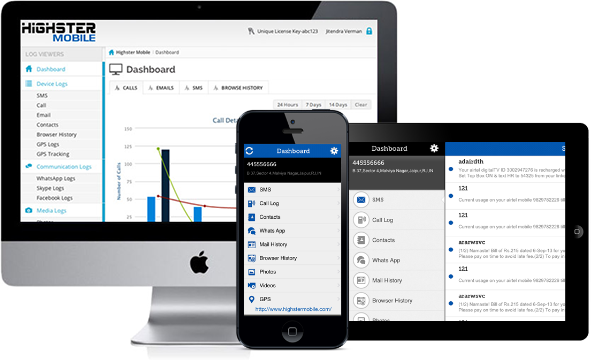 Ideally suited to monitor your children or employees, Highster Mobile is one of the most advanced cell phone tracking and monitoring software used to confidentially record text messages or track call information from a specified mobile device. This is one of the most sufficient application used for remotely monitoring all the activities of a specific mobile phone from anywhere in the world. This application is very easy to install either through over the air links (OTA) by directly typing into the cell phone’s web browser or by directly transferring the application from computer to the target mobile through USB cable or via Bluetooth connection. Cell phone monitoring software is a useful application that can be used to monitor efficiently any individual’s actions or movements frequently. Blocks installation of pre-designated app. Highster mobile has been downloaded over 350,000 times by more than 300,000 customers and has gotten useful information for countless people. Highster mobile will get you the information you need so you can begin living a better life! The extraordinary benefits of today’s advanced communication technology have improved our lives beyond any scope of doubt. The stunning features of the advanced smartphones are extremely popular with everyone in our culture, regardless of age. However, it should also be understood that the easy availability of mobile phones has brought about new challenges for all of us. Today, a large percentage of parents around the world are worried about their children’s constant attachment to mobile phones. These responsible parents feel the need for a technology that can help them keep an eye on their children’s mobile phone and its use. Similarly, improper use of company provided mobile phones have also increased significantly over the years. In both these cases, the problem can be solved by using Highster Mobile, a high-quality mobile phone spying program that can spy on a cell phone without having access to it. As soon as a child gets a new mobile phone, he/she starts building her own private world around it. Unfortunately, it is not easy for the parents to find out what is happening in this world on a minute-to-minute basis. Parents often feel worried about the type of friends their kids have and how they interact with their friends on their mobile phones. Nowadays, almost all advanced mobile devices are internet enabled. Teenagers using these phones because they can visit their favorite social media networks, chat rooms, gaming sites, and much more. Most of these forms of online entertainment are not meant for naïve minors but they inevitably end up in their hands. However, most young children are easily drawn towards them because of their inquisitive and immature nature. Highster Mobile can track almost everything done from the phone that is being monitored. This includes the contact list, calls, chat messages, GPS location, email correspondance, browser history, photos, videos, and more. It can continuously track the target device from a remote location using a computer or mobile device. Highster Mobile supports most popular social media networks and chatting platforms. Reduction in the number of personal calls made from the office phone. Reduction in unnecessary mobile usage such as playing games, visiting social media, and chatting online during office hours. Increasing the company’s overall productivity by reducing staff idle time. Prevention of data loss of sensitive company information and documents. Keeping track of employees that work offsite. Highster Mobile is considered to be amongst the best cell phone spying software applications, not just because of its excellent features. Mobile phone monitoring application is a relatively new technology, and many users consider this technology beyond their grasp. Highster Mobile can be the perfect choice for them because this simple program can be used by any person without any advanced experience with technology. The application can be installed easily through over-the-air links. It can also be installed by transferring the application to the target device through Bluetooth connection or a USB cable. Once installation is complete, this mobile phone tracking application can be uninstalled remotely from the target device. Following a simple mode of operation, Highster Mobile receives all relevant information from the target mobile device and displays them in the secure online account of the users. Depending on their convenience, users can access this information on their tablet, cell phone, and computer. After purchasing this application, users receive their download link, username, password, license key, and an instruction manual. The program is compatible with all the latest Apple and Android mobile devices. In both cases, physical access is required to the device for approximately two minutes. Moreover, the application functions satisfactorily with all mobile service providers. The company also has a highly proactive support team to solve any problem you may face while using Highster Mobile. One time cost of $69.99 without any monthly fee or hidden cost. Device requirements: Physical access to the target phone for approximately 2-3 minutes is required except for Non-Jailbreak version. Apple ID and password are required for Non-Jailbreak version. It is the responsibility of the end user to comply with all federal and state laws. Cell Phone Spy software will allow you to monitor mobile phones as a tool NOT for illegal purposes. Use at your discretion.